Did you know that the earlier in the autumn that you get your plants in, the stronger the root systems will become and the more prolific the flowering will be in spring? Well with these perfect Primulas you will enjoy super duper prolific flowering!! 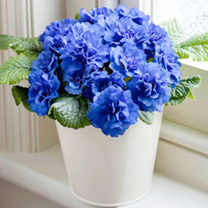 Brand new for autumn 2013, our Primula Belarina Collection is the creme de la creme of 21st century British breeding. With a wide range of colours such as Cobalt Blue, Valentine Scarlet Red, Buttercup Lemon Yellow, Cream and the deliciously named Nectarine Orange Flare .....there is no room for even trying to resist these beauties. Primula Oak Leaved Mix is another brand new hardy primula and one that is perfect for pollinators. The unique scalloped/lobed leaves look like those from an oak tree and the plants can produce around ten flower stems in a season, each one bursting into a cluster of 15 - 30 vibrant blooms! Also brand new are the Candelabra Primulas which are magnificent Asiatics which produce rosettes of semi-evergreen leaves and tall elegant flower spikes. Choose from the elegant beesiana, oh so sunny and bright bulleyana or the wonderfully eye-catching chungensis with which to produce a dramatic whirl of colour in your garden.